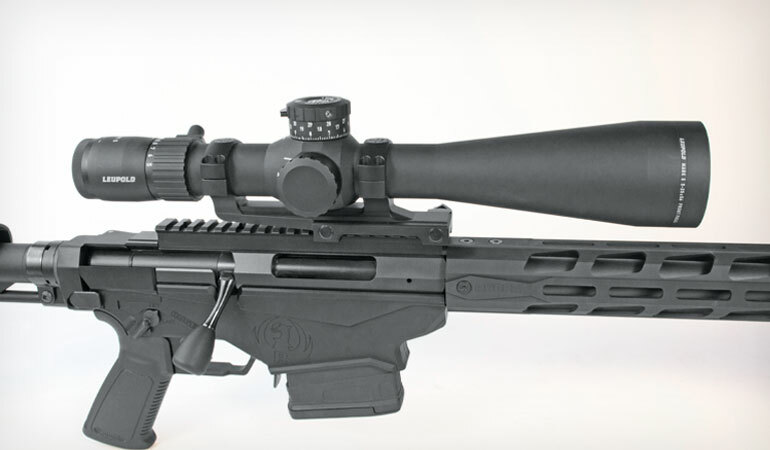 The Leupold Mark 5HD, mounted here on a Ruger Precision, is a serious long-range scope. Dedicated long-range riflescopes are monster-size by necessity. 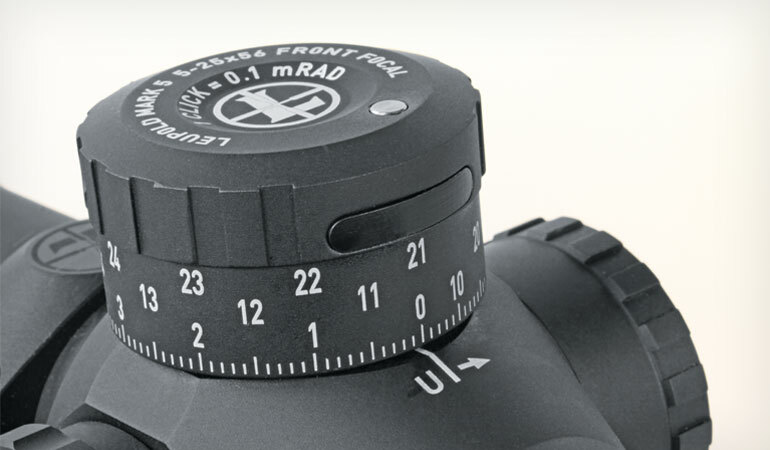 It takes a lot of tube to allow dialing up a reticle for ranges that extend out to a mile or even more, but the problem is they can become boat anchors. 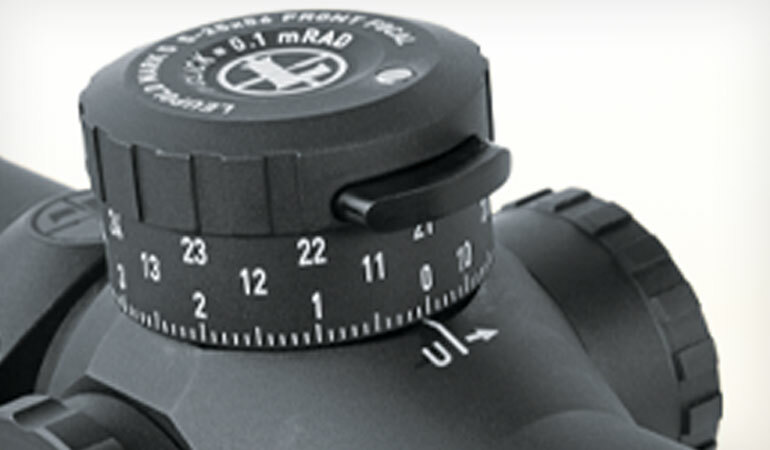 Enter Leupold’s new Mark 5HD, which is up to 20 ounces lighter than comparable optics. The model I tested, the 5-25x56mm, weighs a relatively svelte 30 ounces. Overall length of the 6061-T6 aluminum 35mm main tube is just a hair over 15.5 inches, and of that, 6.25 inches is mountable tube length. For testing I used Leupold’s Mark 6 IMS base, which weighs 8.2 ounces and carries a suggested retail of $470. I love one-piece scope mounts for rigs like this, and the Mark 6 is solid and easy to set up. At a suggested retail of $2,600, the Mark 5HD is for serious shooters looking for the ultimate in glass and adjustment integrity. For the latter I conducted a somewhat different box test than I usually run—an 8x16-inch rectangle rather than a square. The Mark 5HD passed with flying colors. The locking button on the elevation turret protrudes for the first revolution. The scope uses Twilight Max HD light management system. As a Leu- pold rep once explained to me, it’s all about how light in a lens system is managed—not how much light is pumped through the scope. With Twilight Max HD, the goal is to provide a high degree of fine detail. I have not tried this system under the conditions in which it’s supposed to excel—really early and really late in the day—but in normal conditions it’s exceptionally crisp. Plus I found its clarity terrific for applying wind holds when heavy mirage was making the steel targets swim. The locking button on the elevation turret is flush for the second revolution. The Mark 5HD is a first-focal-plane scope. In the case of the model I tested, it offers 34.9 mils of elevation adjustment and 17.5 mils of windage adjustment. The windage dial is capped, and the elevation dial features a lock that also acts as a visual and tactile indicator of where you are. Once you’re zeroed, loosen the turret set screws and move the dial to 0. Then tighten the screws. Press the pop-out button to unlock the turret; the button protrudes. Once you’ve gone through one revolution and are at 21 mils elevation, the button moves from protruding to flush, which you can see and feel. When you’re totally out of elevation adjustment, the button withdraws slightly within the cap. That’s a handy feature, as is the integral throw lever, permitting easy and fast power changes. If you’re not a throw-lever fan, the knurled knob is easily removed with a slot screwdriver, and a filler screw is provided. The sample I tested featured Leupold’s TMR reticle. It sports hashmarks 0.5 mil apart for the first four mils. The fifth mil is segrated into 0.2 mil segments, handy for getting the hold right on the most distant targets. Beyond this point, the reticle gets thick, with the hashmarks presented in one-mil increments. The other feature I really appreciated is the tiny open “box” where the crosshairs intersect. It makes for quick framing, whether the target is paper or steel. The locking button on the elevation turret is recessed at the end of travel—a visual and tactile reference. Overall, I really loved this scope. The adjustments are spot-on, the reticle is versatile and easy to use, and the glass is as clear and sharp as you could want. If you’ve got the cash and are serious about long range, you won’t go wrong with this one.